The most important aspect to cooking barbecue on any of these pieces of equipment is temperature control. You need to be able to maintain a consistent temperature, on whatever you are cooking, this means controlling fuel, and especially air flow. The more air you have flowing through your bbq cooker, the hotter it will be. If you slow down this air draw, you can then control your temperature. In order to know what temperature you’re cooking your bbq at, you need a thermometer inside your cooker. The cheapest means of doing this is an oven thermometer, place this at the same level your meat is cooking at. An oven thermometer does not adjust quickly to the surrounding temperature, so a quick look will give you a fairly accurate reading of what the temperature is. A better means of checking temperature inside your barbecue cooker is by using an electronic probe thermometer inserted into the pit, at the cooking grate level. By using this means, you can keep an eye on your cooking temperature without opening the cooker to check it. However, you need to make sure that what you’re using to do this is made to be accurate at temperatures above 180 degrees F. Many probe thermometers begin to lose their accuracy pretty dramatically above this temperature. Most cookers come with a thermometer built into the door or lid. You can certainly use this, but keep this in mind, you will need to make sure it’s calibrated, and that is located close to where your meat is, in your bbq cooker. The next tool in your arsenal, and arguably the most important one, is an instant read thermometer. The simple dial instant read that you can buy almost anywhere, will surely work, as long as you keep it calibrated. This is usually done using an ice bath, which is a container filled with ice, and a small amount of water added to fill the gaps between the ice cubes. This should read 32 degrees F; you can then adjust the lock nut on the back to make sure your thermometer reads properly. You can also use boiling water; however, water boils at different temperatures, based on how close you are to sea level. Again, you can buy electronic probe thermometers, and place them into your cut of meat, and watch the internal temperature throughout your cook, but as mentioned previously, you need to make sure they are accurate above 180 degrees F. Since most cuts used for barbecue, are larger, more fibrous cuts, and the goal is to cook them until they are tender, their finished temperature will be well beyond 180 degrees F.
Kevin Bevington is the Pit master for the Championship BBQ Team, HomeBBQ.com He has won over 50 Championship Titles including 27 Grand Championships, and 27 Reserve Grand Championships. 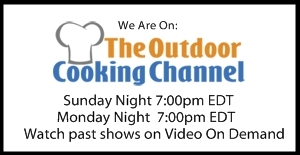 Kevin is releasing 2 DVD’s for the Backyard Cook, Grilling with HomeBBQ.com and Backyard BBQ with HomeBBQ.com. He also sells some of the finest bbq and grilling rubs, and Barbecue Sauce, the actual products he uses in Barbecue Competitions.